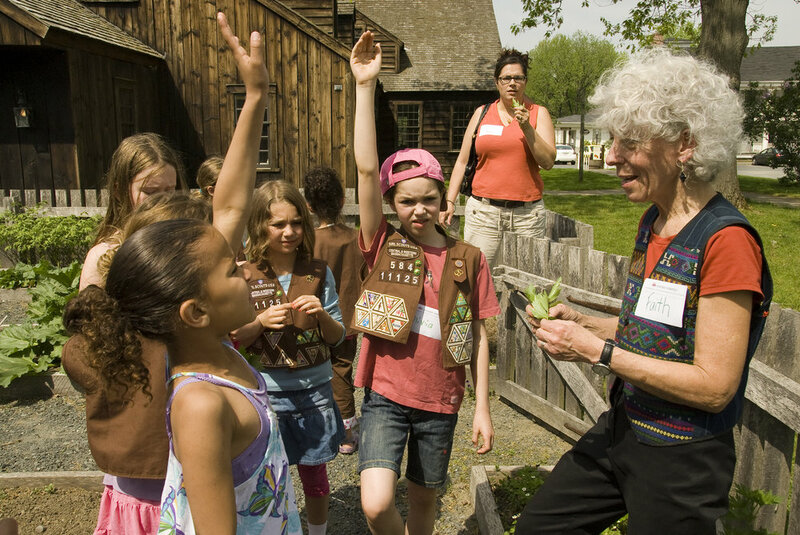 Historic Deerfield has planned a series of scheduled programs to help Girl Scout groups accomplish multiple steps toward earning badges using the collections and resources available at our museum of early New England Life. Contact us to register for one of the scheduled programs listed here, or to inquire about scheduling a custom designed program on an alternative date. Contact Faith Deering, Museum Educator at (413) 775-7116, fdeering@historic-deerfield.org. Registration deadline is 2-weeks prior; program is limited to two troops, or 20 girls. When you visit Historic Deerfield you will take on the role of a girl in the past, a girl who actually lived in Deerfield in the 1700’s. Girls in the past were just like you in some ways. In many ways though, their lives were quite different. As part of earning the badge you can wear some old fashioned clothes, walk to our one-roomed school house where you can write with a quill pen and play school yard games. Making a sweet scented sachet and visiting our hearth kitchen will complete your badge requirements. $6 per girl plus $3 for supplies, adults free. Registration deadline is 2-weeks prior. If you have ever wanted to make something from wood, something you will feel proud of, join us in Historic Deerfield at our colonial woodworking shop. You will learn about hand tools of the past and some of the techniques used by carpenters to make utilitarian and beautiful objects. Under the careful supervision of a woodworker you will use a hammer, saw, and other tools to start a special wooden project, one that you can finish and say, “I made it myself.” Come back on your own time and visit one of our historic houses to see the work of skilled carpenters of the past. Curriculum ideas and background information will be provided to help complete all of the badge steps. Badges are not included in the cost of the program but can be purchases at any GSCWM store. Open to troops and single girls with an adult. Join us to see the wonderful pottery collection in Historic Deerfield’s Museum of Early New England Life. After looking closely at the pottery you will visit our Apprentice’s Workshop to complete more steps of your badge as you learn about clay, try your hand at techniques used by potters of the past and make a small clay pot with a lid. You will take your pot home with you and decorate it during a troop meeting. Badges are not included in the cost of the program but can be purchased at any GSCWM store. Open to troops and single girls with an adult. $6 per person plus $3 materials fee, adults free. As a Museum of Decorative Arts, Historic Deerfield offers a unique place to learn about textiles. During the badge program scouts will visit the museum’s collections housed in the Flynt Center for Early New England Life. On view are period textiles, quilts, embroidery and clothing made of wool, silk, linen and cotton. After a close look in the textile gallery the girls will move to a comfortable classroom where they will learn how to sew their own 18th century fabric sewing kit, known as a “Housewife”. The program will conclude with a visit to one of Deerfield’s Historic Houses where scouts can view tools and equipment related to textile production in colonial New England.